Penalty kill coming up for UW as Zirbel is called for slashing. Halfway through the second and the Badgers trail 3-1 but lead SOG 12-10. OSU 3, UW 1, 10:03 left/2nd. Badger slash in the offensive zone puts Buckeyes on the power play for the 3rd time. 0-for-2 so far. UW's Zirbel off for an offensive-zone slashing call. OSU on its 3rd PP, 0/2 with no SOG. Jurusik looks like he pulled a muscle on a slide. He's down. Looked like Jurusik got a skate caught while moving. He's being helped off. Jurusik has to be helped off the ice with an injury. Jack Berry back into the game for the Badgers. So Jack Berry is back in the net. 9:45 left in the second, OSU leads UW 3-1. Linhart and Joshua now head off for penalties so it will be 4-on-3 for 1:20. Correction, it will still be a 5-on-4 power play for OSU. UW's Linhart for cross-checking, OSU's Joshua for embellishment. FYI, it looked like a left leg on Jurusik. His injury earlier this year was his right knee. He stopped the only shot he faced in 3:11. Kill! Teams are back to even strength with under eight minutes left in the second period. 7:18 left in an eventful second period. OSU leads UW 3-1. OSU 3, UW 1, 7:18 left/2nd. Media timeout. Shots are 5-4 UW in the period. Buckeyes are now 0-for-3 on the power play. Buckeyes bundle one in to make it 4-1 with 5:38 left in the period. BUCKEYES GOAL: Miguel Fidler on the rebound after Jobst flies through the UW defense on a faceoff win. 4-1 OSU with 5:38 left in the second. Jobst's rush up the middle off a neutral-zone faceoff win caught UW's defensemen flat-footed. Looked bad live, worse on replay. 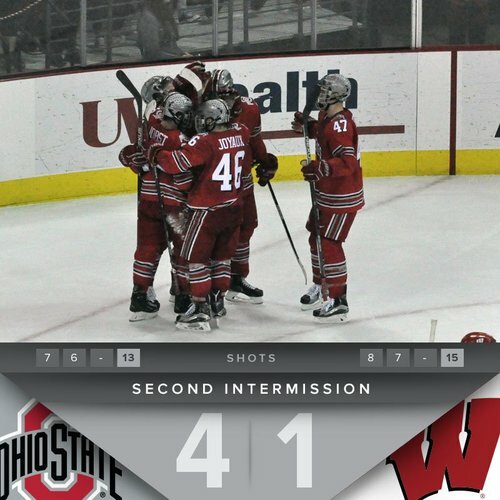 END 2: Ohio State leads Wisconsin 4-1. Shots on goal 7-6 for UW in the second, 15-13 for the game. Some good news from Ann Arbor. Michigan has defeated Penn State which means UW clinches a top-two spot and bye in the B1G tournament. Michigan beats Penn State 3-2, so the #Badgers have wrapped up at least the second seed in the @B1GHockey tournament. Ohio State can move past Penn State into third place with a victory tonight. Buckeyes lead UW 4-1 after two. UW and OSU back out for the third period. 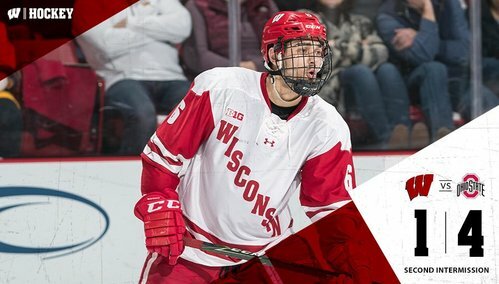 Badgers down 4-1 but lead SOG 15-13. Ohio State leads UW 4-1 as the third period starts. UW leading scorer Luke Kunin got his first shot on goal of the game 16 seconds into the third period. Max Zimmer, scoreless in his last 15 games, hit the right post for UW. Badgers stringing together a few good shifts. Good opening five minutes to the period for UW but they can't find the back of the net. They trail by three. UW's Frederic off for boarding, giving OSU its 4th power play (0/3). Frederic is sent to the box for two minutes and the Badgers will send out the PK unit with six minutes gone by. UW's Ryan Wagner had a breakaway and scored but it was whistled dead because of a scrap at the other end -- Greenway and Joshua. Greenway and Joshua are given two minutes for roughing and ten minute misconducts. I thought I saw Greenway throwing punches, but he and Joshua both get 2 for roughing plus 10. UW appeared to score shorthanded, but no goal because the whistle had blown for matching penalties in UW zone. Buckeyes score on the power play to make it 5-1 with 12:24 left in the game. BUCKEYES GOAL: Mason Jobst scores on the power play, and it's 5-1 OSU over UW. UW gets a power play as Hughes is taken down in front of the net.